Kaptain Skurvy is a recurring character and villain on the Donkey Kong Country animated series. He was voiced by Ron Rubin. Skurvy's model is a recolor of Klump's, as the two are identical besides their scale color and clothes. Some time before the events of the show, it seems that he and Cranky Kong had some sort of encounter, which ended with Skurvy stranded on a desert island, getting lost at sea, and getting chomped by sharks. However, Skurvy managed to escape no worse for wear, and considers those events to be "fun and games." Skurvy's first appearance on the show was in the episode "Booty and the Beast". In this episode, Skurvy, along with his shipmates, Kutlass, Green Kroc, and Polly Roger, attempt to steal the legendary Crystal Coconut; which Skurvy believes to be his birthright, as his great-great-great-grandpappy was the one who first discovered it and was the one who brought it to Kongo Bongo Island. Capturing Donkey Kong and Diddy Kong, Skurvy's theft seemed to have gone on without a hitch. Unfortunately for Skurvy, interference came in the form of an abnormally large Klaptrap. Jr. Klap Trap managed to free Donkey and Diddy and during the fight between the Kongs and Skurvy's crew, Jr. Klap Trap actually ate Skurvy's ship. After this disaster, Skurvy was sent packing along with his crew (minus Polly Roger, who had seemingly joined the Kremling Krew). Skurvy and his minions returned in the episode "Legend of the Crystal Coconut". Here, Skurvy once again attempted to steal the Crystal Coconut, but was unfortunately hindered in his plan due to the fact that the Crystal Coconut kept switching hands between the Kremling Krew and the Kongs. At the end of the episode Skurvy does manage to gain the Crystal Coconut, only to lose it seconds later. It seems Donkey Kong had thrown the Crystal Coconut at Skurvy a little too hard as it ended up knocking out Skurvy's sore tooth out. Due to this, Skurvy had to give the coconut back to Donkey, as he had sworn on the Great Great Great Pirate Oath that he would grant a favor to anyone who knocked out his tooth, and the favor Donkey asked for was that Skurvy give the Crystal Coconut back. In the episode "Bug a Boogie", Skurvy tries to steal the Crystal Coconut once again, and this time succeeds and even manages to steal everything in Cranky's Cabin along with it. Unfortunately, Skurvy loses the coconut once again after he is tricked by King K. Rool into giving it back. Skurvy's next appearance was in the episode "Ape-Nesia". Here he tricks an amnesia-stricken Donkey Kong into thinking he was Skurvy's first-mate, "Donkey Croc". Skurvy manipulates Donkey into stealing various objects, including the Crystal Coconut. Eventually, Donkey regains his memory and tricks Skurvy, along with K. Rool, into falling into a banana peel ridden trap. The end of the episode shows that both Skurvy and K. Rool both gained amnesia. Kaptain Skurvy and his crew mates, Green Kroc (left) and Kutlass (right). The last appearance of Skurvy was in the Christmas-themed episode, "The Kongo Bongo Festival of Lights". In this episode revealed much of Skurvy's origin, the most startling revelation being that K. Rool's general, General Klump, was Skurvy's long-lost younger brother. It was revealed that Klump, as a young boy, had set off some fireworks, causing a large fire that devastated his and Klump's family swamp. Skurvy, in a show of brotherly love, took the blame for the accident and was banished from the swamp. He then ran off and became a pirate. The end of the episode reveals that Klump had planned on leaving the Kremling Krew and joining Skurvy's crew, much to the protests of K. Rool. "The Kongo Bongo Festival of Lights" seems to reveal why Skurvy was so cold-hearted as to do something as bad as break the Kongo Bongo Festival truce between the Kongs and the Kremlings (something even K. Rool wouldn't do). It seems that losing Klump gave Skurvy the philosophy that if he couldn't "steal back what was lost", he could "steal everything else". 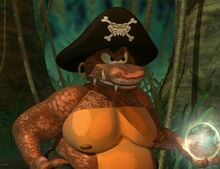 Kaptain Skurvy, perhaps intentionally, resembles a Kannon, a type of Kremling from the games Donkey Kong Country 2: Diddy's Kong Quest and Donkey Kong Land 2; Kannons are simply Klumps (the species) in pirate garb, thus explaining Klump (the character) and Skurvy's similar appearance. 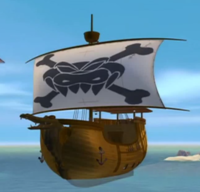 Skurvy's unnamed ship resembles K. Rool's vessel, the Gangplank Galleon from the game Donkey Kong Country, among others. This page was last edited on March 25, 2019, at 14:09.